Cannon County High School junior Hannah Whited made her third trip to the TSSAA Spring Fling on May 26 as a member of the Murfreesboro Central Magnet track and field team. She was a part of the 4x800 Relay team, which competed for a state title at the TSSAA Class A/AA State Track Meet at the Dean A. Hayes Track and Soccer Stadium on the MTSU campus. In front of a standing room crowd of over 1,500, and temperatures in the low 90s, the Lady Tigers were one lap away from defending their state title in the same event. 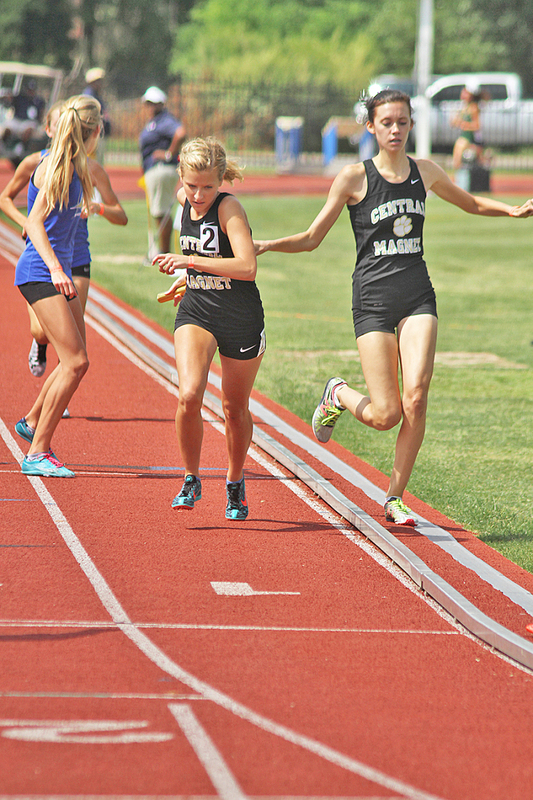 However, the Christian Academy of Knoxville anchor runner passed Whited on the first turn of the final lap, and she pulled away from Whited to win the state title. MCMS finished second in a time of 9:47.39, while CAK won in a final time of 9:38.36. Coming into the Spring Fling meet, MCMS was ranked second, while CAK was third. However, CAK saved an alternate runner for the state meet after not using her in previous meets in the same relay event. According to the TSSAA, this move is legal, but it played a role in deciding a state championship. The Lady Tigers, including Whited missed out on a chance to repeat their 4x800 state title from 2015. "We did okay, but the team that came in front of us, one of their runners was unexpected," Whited said. "So, it kind of put us off in our placement a little bit, but other than that I think we performed well." Whited was a member of the four distance relay team along with MCMS student-athletes, Camille Smith, Abby Graves and Caroline Smith, which finished second at the Class A/AA Middle Sectional on May 19 in a time of 9:54.03 just behind event winner East Nashville Magnet School. The Eagles finished with a winning time of 9:54.03. However, it was good enough to qualify for the Spring Fling. "It means a lot going out there as a team," Whited said on May 20. "It creates good memories, and being able to have the privilege of running together, especially doing what we like." She also tried to advance to the state meet in both the 800 meter run and the 4x400 relay, but each of them finished sixth, which was not good enough to qualify for it. However, this was the third trip in three seasons to the Spring Fling as a member of the Lady Tigers track team to go along with three state appearances for the Lionette cross country team during the same time period. MCMS track and field distance coach Julie Mullane has been pleased with Whited's performance this season along with the way she blends in with her teammates at a different school. "Hannah is the lynch pin of the team," Mullane said on May 20. "She is so genuinely sweet and down to earth with no ego to speak of-she is naturally easy to like. The group of girls I have are phenomenal in their respect for and mutual enjoyment of each other. Hannah is quietly competent. She will run any race and relay with any group of girls--it is refreshing to work with someone who is not only talented, but who simply enjoys the opportunity to run-either seriously like the 4x800 chance of a state championship or helping out a sprint medley at a Doug Hall relay." Coming into the Spring Fling, the 4x800 relay team had the second best time in the state behind the ENMS team who beat them at the sectional meet last week. However, Whited admitted the Lady Tigers could have ran better at the last meet, but they want to run their best at the biggest race of the season. "It was not our best performance we could of definitely, if we all could have ran our best times we could have gotten first, or been head to head," Whited said. "I think our performance was still well, and we are saving our energy for state." What makes the Spring Fling special for Whited is the chance to have to only make the short 20 minute drive from Cannon County to Murfreesboro for the most important meet of the season, and run in front of family and friends. "It's really nice, because it helps my nerves," Whited said. "It is all familiar surroundings, and it helps a lot." Each year, the state meet draws a capacity crowd at the same stadium, which just hosted the 2016 Conference USA Outdoor Track and Field Championships for the Blue Raiders. It is by far the biggest crowd the state's high school track athletes see all season in the meet, which decided state champions, and the huge attendance helps her perform better. "It is definitely nerve-racking, but it helps you perform better," Whited said of running in front of a big crowd. "There are so many people watching you. It makes you want to do well."